Narration - but with no Books! Narration is a study tool, that has made big impacts on the homeschool scene by Charlotte Mason followers. Narration is really a form of "telling information"; generally we read to our child and ask them to tell us what they have heard. As our children get older they may read for themselves but still come back and tell us what they have learnt. In our family we have transferred this skill to a written skill - as our children develop in their thinking ability they are able to read a book and retell their thoughts and understandings on paper without it being initially oral, but it remains a narration. As I have pursued a lifestyle of learning I have come to see that this "telling back" is used all throughout our day, not just when we read and respond to books. Narration is a tool that we can use in our lifestyle learning – outside and away from books. When I went down to take photos Daniel took me on a tour of what was going on. He showed me the different plants that were being planted – though he couldn’t remember their names, he told me the pattern/sequence the trees were being planted in, he showed me how they were keeping the farm tidy by picking up all the nursery pots, and then he took me to the tractor. 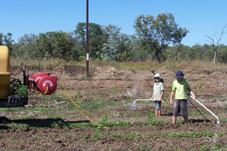 This was his domain – he had been given the task of driving the tractor (at about 2km/hour!!) He showed me how the steering wheel moved so it could be comfortable for his size, and he showed me all the push/pull buttons that were involved in driving a tractor. 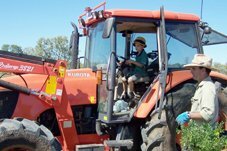 I came away with an understanding of what everyone’s jobs where, what the system was, why certain things were important and most significantly I came away with the knowledge that my 8yo son had just learnt to drive a tractor!! As I have said, when we talk of narrations, we are usually discussing a learning tool for when we read a book; we want our children to listen, to take on board the information, to think about it, to speak it out and therefore make the knowledge their own. This is exactly what was happening for Daniel out in the paddock. He was listening and observing the whole tree planting experience, he connected different bits of information to each other, he was speaking it out and making it his. I am sure he won’t forget these details. He was narrating. Every situation in our life has an opportunity for learning and "telling back". In Daniel taking me on a tour of the tree planting operation he learnt something in the areas of Science and Technology; trees growing, systems in place, and machines working. When he told it back to me, this gave him opportunity to process the information and make it his. There must be other areas in our life where I can make the most of what is normally seen as "chatter" and start to see it as a "narration." Repeating a Current Affairs/News item that someone didn’t hear. I encourage you to see the conversation that goes on in your house as a Narration – the children are collecting information, connecting it to other pieces of information, and telling it back to you and in the process they are committing knowledge to their memory. Read more about Narration, What is Narration?